road off parking area goes under railroad overpass into park. There is public access parking from May thru October at $5/day or $30/season. 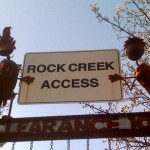 Free parking is always available just off Rock Creek road at the entrance. A beach. A walk. A parking lot with cool fish art. 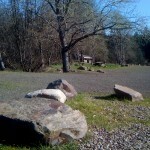 Waterfront park covers 20 acres and is located between two creeks: Mosier Creek and Rock Creek. 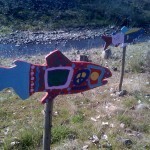 This is where you can access both Windsurf Beach, the River Trail/Harmony Lake loop.